Our Chamber recently celebrated its 145th year of service to our beloved community. This fact, along with the election of Mayor Emily Larson, has me pondering the inextricable connection and collaboration that exists between the Chamber and the City. The City and the Chamber were incorporated in the same year. Consider for a moment how many Duluth mayors the Chamber's leadership has partnered with since our shared start in 1870. Let's suppose that each mayor served an average of eight years. This would have the Chamber's leadership working in partnership with eighteen mayors over the past 145 years. Most recently, it has been my privilege to work with four of these eighteen mayors: Mayors Doty, Bergson, Ness and Larson. Each mayor brings to the leadership position his or her unique set of skills, interests and convictions. The Chamber enjoyed a positive and constructive working relationship with Mayor Doty, Mayor Bergson and Mayor Ness. It is understandable that we anticipate enjoying and benefiting from a positive partnership with Mayor Elect Larson. 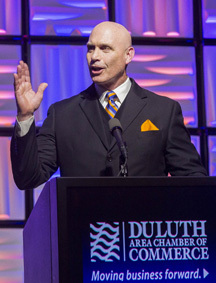 In a recent Duluth News Tribune editorial, Mayor Larson expressed that Duluth's future depends on applying a collective determination to meet the needs and opportunities of being a changing city. She indicated that neighborhoods and organizations need to work together to create Duluth's path to prosperity. Well said, Mayor Larson. Duluth clearly is advancing briskly and purposefully on our shared path to prosperity. Yet, Duluth's success has been hard fought. It has required the dogged determination, perseverance and unshakable optimism displayed by those Duluthians who have gone before us. They advanced our Zenith City during times when our community's path to prosperity was far less clear, and when it was far more difficult to traverse. The sun is bright and high above Duluth's magnificent ridgeline. The wind rolling in off the Greatest of the Great Lakes is at our back. Employment is at a record high. Investment in Duluth is at a record high. Duluth's positive reputation as an enchanted place is being embraced across the nation. 145 years of our foremothers and forefathers preparing the way for us has brought us to this ideal position. Their shared collaborative effort has us here. It is wise to press forward while honoring this collaborative spirit. The Chamber intends to do precisely this. We will embrace our partnership with our talented new mayor.